I have been a studio potter and brush maker since 1993. Working with natural materials has become my passion; it’s like meditation for me. This creative consciousness has been keeping me going, reaching from the inner to the outer world, as we are a part of Nature. My work reflects my Chinese heritage, the language of blue and white create class contrast; the brush and cobalt blue gives me the freedom to create new spaces. The ornamental images have great meaning; the fish is symbolic of prosperity, riches and harmony. The flower is a symbol for beauty, peace and joy. My goal is to capture the essence and the spirit of the traditional while reminding people of the beauty that exists in all creatures. 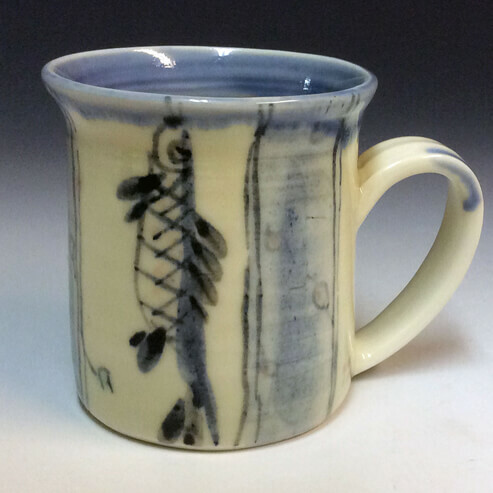 My work is individually created on the wheel and glaze fired in an electric kiln. I love working with clay, I love the softness of each brush stroke, and I love the classical feeling of blue and white. It is an evolving, exciting, and sometimes frustrating journey that has continued for over twenty years. I am always looking for a kind of beauty and taste in my ceramic work, that is related to my strong Chinese ceramic heritage. I love working with white porcelain clay, clear glazes, spontaneous brush strokes, decorating with blue, green, and red on the surface of the pots. Merging with contemporary expressions and taste to our daily life.